One of the few activities our hominid ancestors engaged in, for which evidence is available to us, is tool making. Many animals such as birds and chimpanzees engage in tool making so it is hardly surprising that our hominid ancestors made and used tools. Many of the earliest tools would have been made of wood and bone and other materials which decay and left no trace for archaeological inspection. The earliest tools which we have available for archaeological study are stone tools from about 2.6 million years ago made by Homo habilis. These tools are known as the Oldowan stone tool industry. The Oldowan tools were made by chipping flakes off an unmodified core with another stone that acted as a hammer. Both the flakes and the core provided useful tools, the flakes being used mainly as cutters for cutting up or scrapping dead animal carcasses or for stripping plants. The cores may have been used for food processing that involved bashing or pounding. The tools were so simple that it was often difficult to distinguish them from naturally created objects. The tools were usually made from quartz, quartzite, flint or chert all of which are crystalline rocks. The Acheulian stone tool industry began about 1.5 million years ago and is largely associated with Homo erectus (except in east Asia) and Homo ergaster. The Acheulian tools are more complex than the Oldowan tools in that the core was prepared before flaking took place and tools were produced that had bifacial cutting edges. Bifacial tools are flaked on both sides so that they are sharper than Oldowan tools. A further improvement was the use of bone or wood hammers that provided better control over the flaking process so as to produce sharper cutting edges. Stone hammering was used to give tools an initial shape but finishing work was done with wood or bone hammers. Acheulian tools included hand axes, cleavers, picks, choppers and flakes. Tools were used for cutting up large animals or for the cutting of branches of trees to provide fuel for fires. They may also have been used for digging up the edible roots of plants and for wood working. The tools were mainly made of flint, quartzite, chert and obsidian. Acheulian tools almost certainly included spears and clubs but evidence for this is rare. There is some evidence for wooden spears from Clacton in England and Schoningen in Germany between 600,000 and 300,000 years ago. One puzzle is that Acheulian tools were not found in East Asia. Among the explanations suggested for this is that the quality of raw materials was not good enough, in that fine grain rocks were rare. A further explanation was that different materials such as bamboo allowed alternative tools to be produced in place of stone tools. Alternatively hominids of East Asia had different needs from those elsewhere so Acheulian tools were not required. The effects of the improved tools used by Homo erectus would have been to allow some population increase due to the greater ability of Homo erectus to hunt and to protect his or herself from wild animals. Meat derived from hunting large animals was a much greater part of the diet of Homo erectus than it was for earlier hominids. The improved hunting ability would have come both from the use of better tools and from the use of fire by Homo erectus. A further effect of the use of improved tools and the use of fire was that Homo erectus was the first hominid to live not just in Africa but also in Europe and Asia. The Mousterian stone tool industry began about 200,000 years ago and lasted till about 40,000 years ago. It is particularly associated with Homo sapiens neanderthalensis but the tools were also used by Homo sapiens sapiens. The Mousterian stone tool working techniques involved the careful preparation of a stone core before a flake was struck from the core. This could involve shaping the core into a round surface by trimming the edges of the core and then further trimming to shape the flake that is to be struck off. Only then would the flake be struck off. An alternative system was to shape the core into a prism and then to strike off triangular shaped flakes. Flakes would then be worked with additional trimming to sharpen their edges to produce a better cutting edge. Flakes were produced for many specialized purposes. Hand axes and tools for cutting up meat similar to earlier times were used but were better made and more efficient. New tools such as points for spear heads were made which were attached to a wooden shaft being the first evidence of composite tools being used by hominids. The Upper Paleolithic tool industry ran from roughly 40,000 years ago to 12,000 years ago. The Upper Paleolithic period comprised a series of tool making periods known as the Aurignacian (40,000 to 28,000 year ago), the Gravettian (28,000 to 22,000 years ago), the Solutrean (22,000 to 19,000 years ago) and the Magdalenian (18,000 to 12,000 years ago). The Aurignacian was associated with both Homo sapiens neanderthalensis and Homo sapiens sapiens (more particularly Cro-Magnon man). The other three periods were exclusively those of Homo sapiens sapiens due to the extinction of Homo sapiens neanderthalensis. The rate of improvement in the quality and variety of tools was much faster in the Upper Paleolithic than in the earlier periods. These improvements included better techniques for the working of raw materials. Before this time technology largely involved the use of only four techniques, those of percussion, whittling, scraping and cutting all of which required only a limited range of hand motions. In the Upper Paleolithic new techniques were added including pressure flaking, drilling, twisting, grinding and others, which involved different motor abilities than those previously used. Secondly, in the earlier period the main raw materials used were stone, wood and skin. Later on bone, ivory and antler and less importantly shell and clay were added to the original materials. Thirdly, the number of components in composite tools expanded considerably in the Upper Paleolithic increasing the complexity of the tools used. Fourthly, the number of stages involved in manufacturing artifacts significantly increased in the Upper Paleolithic. Before the Upper Paleolithic manufacturing involved only a short series of single stage operations, while later there were often several stages of manufacture to produce the final product. The number of processes and techniques had increased as had the degree of conceptualization required to manufacture the product. (Dennell, 1983, 81-87). In the Upper Paleolithic there were substantial improvements in the artifacts available to people. Hunting equipment improved by the use of narrow bone or ivory points for spears which had greater penetrating power than earlier flint tipped spears. Spear throwers and the bow and arrow were also introduced allowing prey to be killed from a greater distance. Cooking was made more effective through the use of cobble-lined hearths which allowed heat to be retained longer and at a more even temperature. Improvements in clothing seem to have been made between the Middle and Upper Paleolithic providing humans with much better protection against the elements. Eyed needles seem to have been invented around this time. Housing became more sophisticated in the Upper Paleolithic with many structures being made of mammoth bones suggesting that some sort of sophisticated transport device such as sledges were used to move the bones. Art which played little role in earlier periods, became much more extensive in the Upper Paleolithic. Cave paintings appeared in Europe, Australia and North and South Africa. Many artifacts such as bone needles, ivory beads, spear throwers and bows had engravings or carving performed on them. Artistic objects such as Venus figurines were traded over considerable distances suggesting the Upper Paleolithic had much improved trade and communications than the Middle Paleolithic. (Dennett, 1983, 87-96). Technology developed by hunter-gatherers in the Middle East, to utilize wild cereals, such as stone sickles and underground storage pits were useful to early cereal farmers in the Middle East. The substantial improvements in the tools, clothing, art and general culture of humankind between the lower and Upper Paleolithic could only have taken place with a gradually increasing knowledge of how to make better and better use of the materials in the environment. “The growing efficiency of stone age technology is shown by the ability of ancient stoneworkers at producing ever larger numbers of cutting edge from a pound of flint or other fine grained rock. The Neanderthals were far more efficient stone artisans than their predecessors. 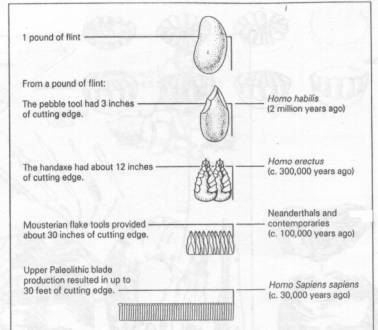 By the same token Homo sapiens sapiens used a blade technology which produced up to 30 feet (9.1 metres) per pound of flint.” (See diagram below). The trend from the simpler less efficient stone tools to more efficient complex tools was inevitable. Our hominid ancestors were always going to find the simplest way to make stone tools before ways to make more complex tools were learnt. This is because it is always easier to learn something simple, than something that is more complicated. The Oldowan tools were so simple they were sometimes difficult to distinguish from naturally created objects and would produce only 3 inches of cutting edge from a pound of flint. The Acheulian tools were often bifacial and could produce 12 inches of cutting edge from a pound of flint. Mousterian tools had a still greater degree of complexity involving considerable preparation of the core before a flake was struck and substantial finishing work being done on the tools. Increased complexity can also be seen in the development of composite tools. The Upper Paleolithic tools reveal even more complexity with new manufacturing techniques and still more composite tools. The order of improvement in Paleolithic stone tools were inevitable as our ancestors were always going to learn stone tool manufacture in the order from the simple to the complex. It is easier to learn how to knock a flake from a stone, then to knock it in particular ways to produce a flake of a particular size and shape. It was also inevitable that people would learn how to knock a flake from a stone, before they could learn that preparatory work on the stone could produce a more desirable flake. One also had to learn to knock a flake from a stone before you could realize that finishing work on the flake could make it a more desirable flake. The order of discovery of how to make better and better stone tools was inevitable and the social and cultural consequences of better tools such as higher population was equally inevitable. The development of better tools was probably dependent upon the increasing brain capacity of our hominid ancestors. Only when new species of hominids evolved were improvements able to be made in tool manufacture and efficiency, until the arrival of Homo sapiens sapiens when the improvements began to happen much faster. Stone tools developed before metal tools as the stone and rocks were plentiful and widespread and the process of hitting one stone with another is a simple and relatively easily developed process. On the other hand native metal (pure metal not in an ore) is very rare and the techniques for working it are more difficult involving heating and hammering. Obtaining metal from an ore usually involves kilns and a complex process of obtaining sufficient heat to separate the metal from its ore. Even further heat was required to melt the metals for making alloys or for casting the metals. Compared to the difficulties of metallurgy the production of stone tools was a relatively straightforward process. Metal tools eventually took over from stone tools as metal tools, or at least bronze, iron and steel tools were superior to stone tools. Cooper was somewhat soft and was not an ideal material for tools, so there is a stone age, bronze age and iron age but not really a copper age. Paleolithic tools that have survived for modern archaeological inspection are mainly made of stone. The tools were largely made of flint, quartz, quartzite, basalt, chert and obsidian. These materials were particularly suitable for manufacturing tools because their chemical structure is cryptocrystalline, which means they are made up of minute crystals. When cryptocrystalline stones are hit by another stone they break in a manner known as a conchoidal fracture. The conchoidal fracture results in sharp edged blades because the cryptocrystalline stones have no preferential fracture planes so blades of any size and shape can be made. These desirable qualities resulted in flint, chert and obsidian being favored rocks for Paleolithic tools. Where these stones were not available similar stones such as quartz, which also brakes in a conchoidal fracture and which is a very common mineral were used. If the properties of cryptocrystalline stones were different then they might not have been an important material for our hunter-gatherer ancestors. If cryptocrystalline stones could not be chipped to produce a sharp edge then there may have been no stone age based upon the use of stone tools. Either human beings would have had to do without stone tools or a less efficient substitute such as bone would have had to be used. A less efficient substitute would inevitably have certain social effects like a reduced ability to kill wild animals leading to less population growth due to reduced results from hunting and a greater mortality from wild animal attacks. This shows that the cyptocrystalline structure of the rocks in the human environment, which break in a conchoidal fracture, have had a major effect on human social and cultural history.